Like Willy the whale, General Motors has finally been freed – or nearly so. Today’s announcement that the Treasury Department had agreed on a process to extricate the government from its ownership stake in G.M., the world’s largest automaker, is welcome news. For General Motors, the separation will conclusively remove the appellation of “government motors,” a stigma that the company had argued affected the buying decisions of a meaningful segment of consumers. The divorce will ultimately also liberate G.M. from a number of government-imposed restrictions, importantly including those relating to executive compensation. These restrictions adversely affected G.M.’s ability to recruit and retain talent. Now, compensation decisions will be made by the company’s board of directors, just as they are in every other public company in America. However, in this case, that was simply not possible, as Mr. Bush and Mr. Obama both concluded. 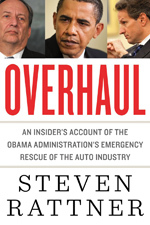 I and the other members of the Obama administration’s auto task force determined that the industry’s crisis was caused not only by the financial and economic meltdown but, equally, by poor management that had run these American icons into the ground and exhausted their cash resources. We were faced with a classic market failure: Not a penny of private capital was willing to provide the financing essential for these companies to keep running. Those (like Mitt Romney) who contend that G.M. and Chrysler could have been restructured without government involvement simply don’t understand the facts. The only alternative to government stepping in would have been for the companies to close their doors, terminate all their workers and liquidate. That would have led to huge failures and layoffs among the suppliers. Even Ford would have had to shut down, at least for a time, because of the unavailability of parts. Here’s another important lesson of the auto rescue: It would not have been possible without the existence of the much-hated $700 billion Troubled Asset Relief Program. Without TARP, we could not have provided the $82 billion to these companies without Congressional approval. And given the dysfunction of Congress, I don’t believe there was any chance that the legislature would have acted within the few weeks that we had before the companies would have collapsed. In a perfect world, I would not be a seller of G.M. stock at this moment. For one thing, the company is still completing the reworking of its sluggish management processes in order to achieve faster and better decisions and lower costs. For another, G.M.’s financial problems slowed its development of new products during 2008 and 2009. Now, a passel of shiny new models offering great promise is about to hit showrooms. And in my view, G.M. stock remains undervalued, trading at about 7 times its projected 2013 earnings, compared with nearly 13 for the stock market as whole. But as my former boss in the White House, Lawrence H. Summers, kept reminding us in 2009, this intervention needed to be the opposite of Vietnam: We wanted to have as small a footprint as possible while the government was a shareholder and to get out as quickly as practicable. While the government still retains (temporarily) a majority stake in Ally, G.M.’s former finance arm (formerly known as GMAC), the scorecard for the auto rescue is nearly complete. Of the $82 billion that the two administrations pumped into the auto sector, Treasury is likely to recover all but about $14 billion. First, the $17.4 billion initial round of bridge loans that was provided at the end of 2008 was necessary only because GM and Chrysler had been utterly derelict in not preparing for restructurings through bankruptcy that were clearly inevitable. G.M., in particular, wallowed in an irresponsible state of denial. Had the companies been properly prepared, the loss of that $17.4 billion could have been avoided. Second, for $14 billion – 0.4 percent of the government’s annual expenditures – more than a million jobs were saved at a time when unemployment in the Midwest was well above 10 percent. The auto industry has not only survived but it is flourishing. Car sales, which had sunk as low as 10.4 million in 2009, are now running at an annual rate of more than 15 million. As many as 250,000 new workers have been added. Disastrous past industry practices – from bloated inventories to excessive sales incentives – have been curbed. As a result, G.M. earn more in 2011 than in any year in its 104-year history. Finally, let’s keep well in mind the most important lesson of the auto rescue: While government should stay away from the private sector as much as possible, markets do occasionally fail, and when they do government can play a constructive role, as it did in the case of the auto rescue.